Black Sticky Rice Pudding Recipe – Gluten Free, Vegan, Yum! This is truly one of those comfort-in-a-bowl dishes. Black sticky rice pudding is popular in Thailand and parts of Asia. It can be eaten warm or cold, and makes a delicious dessert, but it’s equally good for breakfast or as a snack. To serve I use a splodge of coconut cream or coconut yogurt, some fresh seasonal fruit, and sometimes a handful of nuts or seeds as well. It’s endlessly versatile. Black sticky rice pudding is a great recipe – gluten free, dairy free, vegan and full of fibre, anti-oxidants and nurture-y goodness. Black rice is a source of amino acids, iron, zinc, copper and according to Traditional Chinese Medicine (TCM) is great for supporting and nurturing the liver and kidneys, two organs/energy centres that get very depleted during times of stress, illness or depression. It’s great food for people with burnout or adrenal fatigue as it is warm and easy to digest. Coconut is also good for low thyroid function and boosting slow metabolisms. Note – If you are sugar-free use Natvia, stevia or your favourite sugar substitute. Soak the rice overnight (or at least 6 hours) in the water in a ceramic or glass dish. It’s really important to soak your rice well, so please don’t skimp on that part of the cooking process. The water will go a nice shade of purple – try not to get it on you as it will stain some fabrics. Many people suggest you discard the soaking water, rinse and start over, but then you’d lose many of the minerals and anti-oxidants that have leached from the water overnight. Cool slightly and then serve in bowls with the remaining coconut milk/cream drizzled over the top. Sliced banana or tropical fruits such as papaya or mango are also good. In winter I may use berries. Right now I am using a big dollop of coconut yoghurt (yoghurt made on coconut milk!) from a company called Co Yo, which is divine. If I have made a less-sweet pudding, I will sometimes also add a sprinkle of palm sugar or a dash of maple syrup when serving. One of the simple pleasures of my life is to grab a handful of herbs from one of the pots or vegetable gardens at my back door to use in our evening meal. 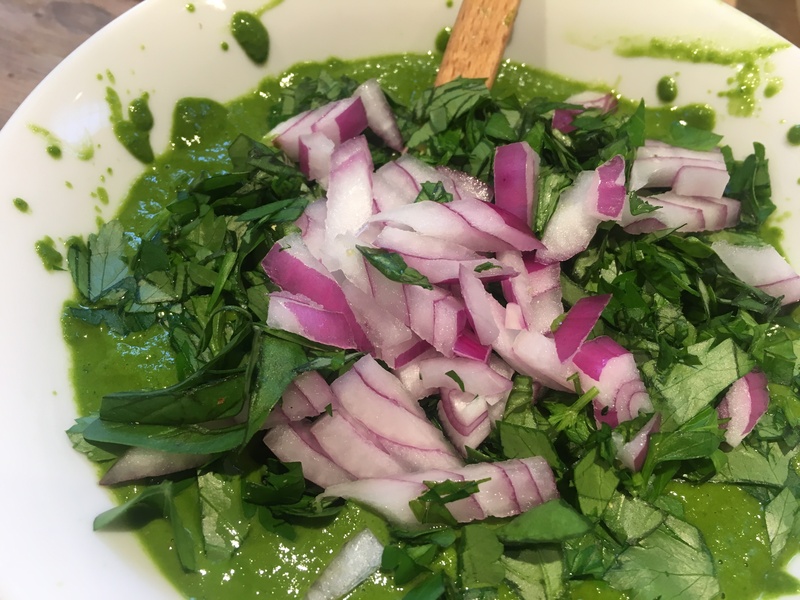 This green sauce recipe takes just a minute or two to whiz together, and it elevates all kinds of meals to a new level of yum. The sauce itself is vegan. It’s also sugar, dairy and gluten free. I love the versatility of this sauce. 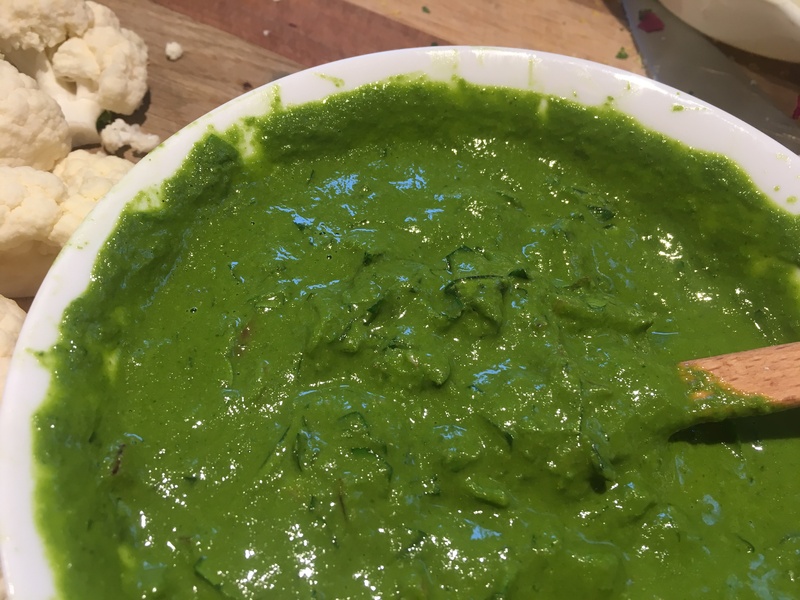 I often use it as a dip with chopped up vegetables, or I fold it through a little yogurt (use coconut yogurt if you’re dairy free) for a creamier version – it’s also good with chunks of fresh bread or crackers. You can spoon this sauce over steamed or baked vegetables, toss it through a bowl of pasta, add it at the end of a risotto dish, or serve it with fish, chicken or any kind of meat. It’s a fabulous accompaniment to barbeques. I’ve even used it as a salad dressing. I’ve given you this recipe base upon parsley and basil, but you can experiment with whatever other soft herbs and edible leaves, including bitter greens, you have to hand. 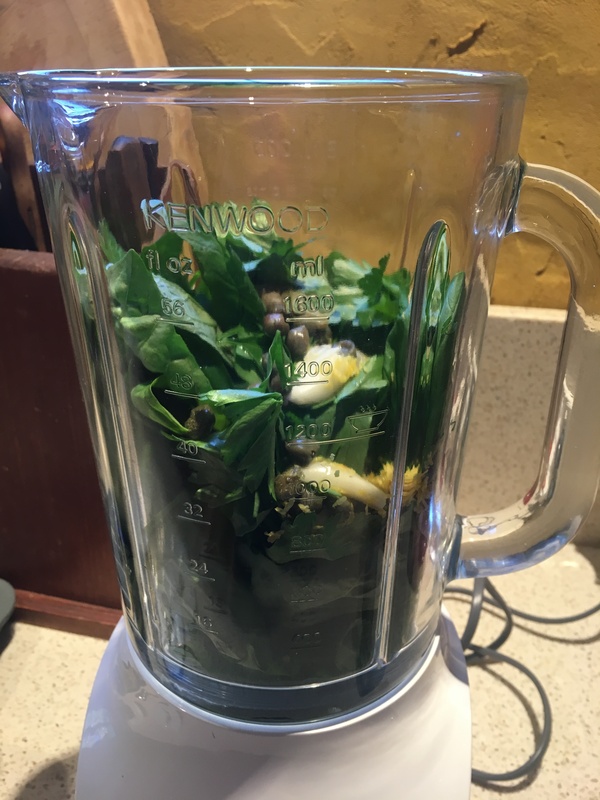 Just a caution on bitter greens – use only 1/4 to 1/2 of your total herbs as bitter ones or the sauce becomes a bit too bitey. This recipe makes about a jar’s worth of sauce. An equal-ish mix of parsley and basil leaves to make three cups. (If you have a little mint, thyme, chives or dill feel free to chuck a bit of that in too!) Up to three cloves of garlic. 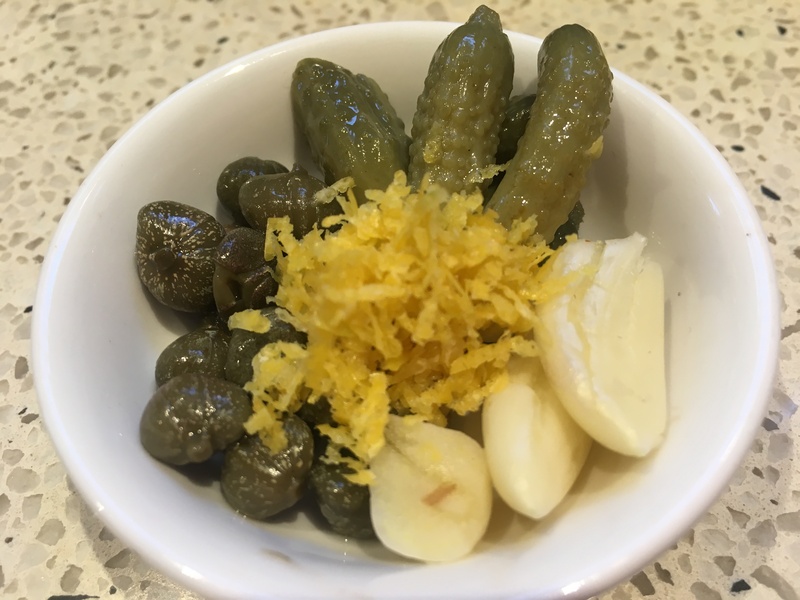 Juice and zest of one lemon, a tablespoon of gherkins, a tablespoon of capers, up to one half cup of extra virgin olive oil, pinch of salt and a grind or two of pepper, half (or one small) red salad onion. Tear the leaves off the basil and add in the tops of the parsley. It’s okay for there to be some parsley stalk – don’t be too particular. Rinse if necessary. Keep one cup of leaves aside and chop roughly. Dump the other two cups in a food processor or blender. Add the peeled garlic, gherkins, capers, lemon zest and juice and 1/4 cup of oil in your processor or blender. Spoon the green sauce into a bowl. Add the chopped herbs and finely diced red onion to the sauce and stir to combine. This gives a lovely contrast of textures. Season with salt and pepper. If there is any sauce left over it will keep in a jar in the fridge for up to one week. The vegan version – green sauce spooned over roasted cauliflower and sweet potato with a fresh garden salad. The meat-arian version – green sauce served over barbecued sausages with roasted cauliflower and sweet potato with a fresh garden salad. Mangoes are finally in season here in Australia. This is a super-easy and yummy mango mousse that tastes of summer and is something you can make all year round, even if you can’t access fresh mango. I’ve made this before with frozen mango and canned mango too. Perfect if it’s winter in your neck of the woods but you’re craving a little sunshine. I’ve adjusted an old recipe of mine that called for cream and loads of sugar, and converted it to a recipe that is dairy-free and refined sugar-free. You can make this as a vegan or a paleo dessert – and it’s so healthy you could eat it for breakfast! All you need to make this is a blender. 270ml can of coconut cream – chilled (or use one cup), cheeks of three fresh mangoes, or the drained contents of an 800 gram can of mangoes or 2 cups of frozen mangoes, 1 tablespoon of agar agar (or use 1 tablespoon of gelatin if you aren’t vegan or vegetarian – this is a great option if you follow a paleo diet), 1/4 cup to 1/2 cup of maple syrup or sweetener of your choice – natvia is a favourite of mine for sugar-free but coconut sugar also gives a great flavour (if you’re not vegan you could also use honey), a squeeze of lime juice or lemon juice if you have no limes! Chill the can of coconut cream in the fridge for an hour or two or until when you shake it there is no liquid sloshing. If you’re in a cold climate it may already be like this at room temperature, but you need your coconut cream cold or it won’t whip. Slice up your mango flesh or drain canned mangoes. Soak your agar agar in 1/3 cup of water so it swells. Do the same if you are using gelatin. It’s fine to use the juice from canned mangoes or any squeezed pulp if you prefer. Place the chilled coconut cream (omit any liquid), mango flesh and agar agar mixture (or gelatin) into a blender or food processor. Whip on high speed until combined and fluffy. The time for this will vary depending on the speed of your motor, but really it should only take a minute or two. Now taste your mixture. Some mangoes are so sweet that they will need little extra sweetening. Add the quarter cup of sweetener (less if you feel it only needs a touch) and the squeeze of lime to freshen the flavour, pulse or blend quickly to combine and then taste again and add more sweetener if necessary until you are happy with the levels. Pour into individual serving dishes or one larger bowl and refrigerate til set. You’ll need at least one hour for this. You can eat the mousse on its own, or garnish with more mango pieces. It’s also fabulous with a side of gelato or ice-cream, or a few gingersnaps. I had a friend coming for dinner and I wanted to make pretty, so I chose a dollop of coconut yoghurt, some grated dark chocolate and a few fresh blueberries as my garnish. The nasturtium flowers made it feel completely celebratory. This is an easy and delicious pudding for people who need to eat gluten and dairy-free, but who still enjoy the occasional dessert. The pudding can also be easily made sugar-free too. It is perfectly scrumptious served with just a sprinkle of cinnamon or nutmeg on top, but fresh banana slices and a drizzle of maple syrup make it out-of-this-world good. 400g coconut cream, 600ml water, 1 scant cup of uncooked white rice if jasmine or basmati or 3/4 cup of shortgrain rice (shortgrain rice has more starch and thickens better), 2 tablespoons of sugar or sugar substitute – I use Natvia (or to taste), 1 teaspoon of vanilla, pinch of salt, nutmeg or cinnamon, fresh banana and maple syrup to serve. Place the coconut cream, water, sugar or sugar substitute, pinch of salt, vanilla and rice in a heavy-bottomed saucepan on the stove, over medium heat. Stir occasionally as you bring the liquid to a strong simmer (lots of bubbles but not boiling), turn down to a low simmer (just a few bubbles on the surface) and then cook for twenty to thirty minutes on low heat or until the rice is soft and most of the liquid has been absorbed or reduced. Stir every so often so that the rice doesn’t catch on the bottom of the pot and burn. Pudding should be thick and creamy. To serve plain, add just a sprinkle of nutmeg or cinnamon. For best results top with slices of fresh ripe banana and a little drizzle of maple syrup. Can also be eaten cold. Store any leftovers in the fridge for up to three days. This is so, so yummy and good. Many years ago, when my sister and I were sharing a house, we’d sometimes venture out for dinner to a little Asian Restaurant in Market Square at Sunnybank. Our restaurant of choice was called Gourmet Court – a cheerful and cheap eating place, which was good because neither of us had any money back then! None of the staff spoke English, and the menu was all in Mandarin, but it did have a helpful photo for each dish. We would always point to what we wanted, smile profusely, and then mime drinking tea. Somehow, this crazy system always seemed to work for us. The tables were covered in red and white checked plastic tablecloths and little vases of fake flowers which was the only decor beside the lucky cat at the till. Simone and I were always the only Caucasians in the place, and we looked out of place with our pale skin and long blonde hair. At first that felt uncomfortable but we were treated so well that we came to love going there. After we became regulars the owners would usually bring us a complimentary dessert at the end of our meal. In winter it was a plate of sliced fresh fruit, but when the temperature warmed up they brought out this unusual dish – a cold, sweet coconut ‘soup’ with tapioca pearls (made from a form of root vegetable called cassava) and freshly diced rockmelon. It was our complete favourite; cool, refreshing and delicious. Gourmet Court no longer exists, but I’ve found a way to recreate our old favourite dish! I hope you enjoy it as much as we do. An added bonus is that it’s gluten-free, and dairy-free. I also make mine sugar-free now too, using a sugar substitute. The tapioca/coconut milk mixture will keep in the fridge for five days, if it lasts that long. Add the coconut cream, water, salt and sugar to a saucepan and stir well over low heat until sugar has dissolved. Remove from heat and cool. Soak the tapioca for twenty minutes in cold water, then drain in a colander. Bring two litres (8 cups) of water to the boil in a large pot, and add the drained tapioca pearls. Stir well so nothing sticks to the bottom, and keep stirring every so often. Bring back to the boil and then reduce heat to medium and cook for 12 to 15 minutes. Turn off heat, cover and let sit for another fifteen minutes. Then rinse well under cold water to stop the cooking process. The pearls should be mostly translucent and jelly-like with perhaps a few white spots still in the middle. Be careful not to overcook, or the tapioca will turn to mush. Add the tapioca pearls to the cooled coconut mixture and refrigerate until needed. The pearls will swell a little more with the coconut milk, and will provide a nice chewy texture. To serve ladle the ‘soup’ and pearls into a serving bowl and then add a generous portion of freshly diced rockmelon to the top. I served mine to Ben and the workmen here at the farm as a post-lunch treat, after they’d spent the morning slaving away repairing fences in the heat. It was soon devoured! Note – this is also delicious served with freshly sliced banana, mango or strawberries. I experimented with a new cake recipe earlier in the week. But it was so good that it was devoured before I thought to take any photos. In fact, I tested two versions. A straight-up version using dairy, flour and sugar and a gluten-free, dairy-free, sugar-free version. Happily, both of them tasted delicious. The cakes are sweet and moist and rich-tasting, but not too heavy. I did contemplate using a cream cheese icing with a hint of mandarin to finish these little cakes off, but honestly, unless the Queen was coming for afternoon tea it would have been complete overkill. That, and the fact that again, at least half the batch was eaten before I could get to the making icing part, after which any kind of frosting seemed redundant. This recipe is inspired by the monster zucchini glut currently underway at our farm. Enjoy! To prepare the mandarins, place in a small saucepan and cover with water. Bring to boil and then simmer one hour. Cool in pan. Slice open lengthways and remove seeds. You could use a spoon for this but I prefer clean fingers. That way you can feel any seeds that are hiding. Seeds make things bitter, so do your best to get them all. It’s an easy job. Pulse mandarins in a blender until smooth. Grate your zucchini to give a generous cup full. Squeeze it lightly to press a little moisture out of it. Then add the zucchini and mandarin pulp to a large bowl and stir well. Spoon into cupcake liners in prepared tins. Bake for twenty minutes or until a toothpick, when inserted, comes out clean. Cakes will rise nicely, but will settle again once cooled. Leave in tins to cool completely. Cake will store well for one week. It also freezes well. Serve to friends, with cups of tea. Or eat while snuggled up on the couch watching old movies. I trialled both methods, and both were satisfactory!